New Hampshire is a state in the New England region of the northeastern United States. The state was named after the southern English county of Hampshire. It is bordered by Massachusetts to the south, Vermont to the west, Maine and the Atlantic Ocean to the east, and the Canadian province of Quebec to the north. New Hampshire is the 5th smallest, and the 9th least populous of the 50 United States. In January 1776 it became the first of the British North American colonies to establish a government independent of Great Britains authority, although it did not declare its independence at the time. Six months later, it became one of the original 13 states that founded the United States of America, and in June 1788 it was the ninth state to ratify the United States Constitution, bringing that document into effect. New Hampshire was the first U.S. state to have its own state constitution. Its license plates carry the state motto: "Live Free or Die". The states nickname, "The Granite State", refers to its extensive granite formations and quarries. Among prominent individuals from New Hampshire are founding father Nicholas Gilman, Senator Daniel Webster, Revolutionary War hero John Stark, editor Horace Greeley, founder of the Christian Science religion Mary Baker Eddy, poet Robert Frost, astronaut Alan Shepard, and author Dan Brown. Additionally, actor Adam Sandler grew up, but was not born in, the state. New Hampshire has produced one president: Franklin Pierce. With some of the largest ski mountains on the East Coast, New Hampshires major recreational attractions include skiing, snowmobiling, and other winter sports, hiking and mountaineering, observing the fall foliage, summer cottages along many lakes and the seacoast, motor sports at the New Hampshire Motor Speedway, and Motorcycle Week, a popular motorcycle rally held in Weirs Beach near Laconia in June. 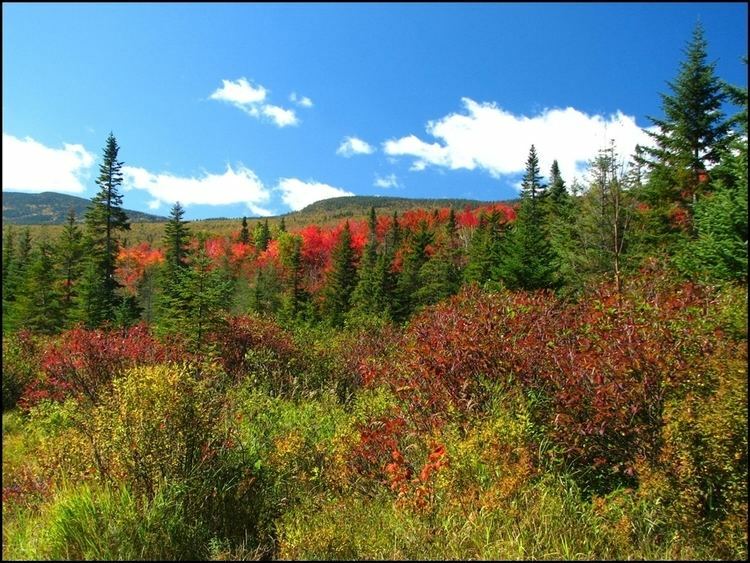 The White Mountain National Forest links the Vermont and Maine portions of the Appalachian Trail, and boasts the Mount Washington Auto Road, where visitors may drive to the top of 6,288-foot (1,917 m) Mount Washington. New Hampshire is part of the New England region. It is bounded by Quebec, Canada, to the north and northwest; Maine and the Atlantic Ocean to the east; Massachusetts to the south; and Vermont to the west. New Hampshires major regions are the Great North Woods, the White Mountains, the Lakes Region, the Seacoast, the Merrimack Valley, the Monadnock Region, and the Dartmouth-Lake Sunapee area. New Hampshire has the shortest ocean coastline of any U.S. coastal state, with a length of 18 miles (29 km), sometimes measured as only 13 miles. New Hampshire was home to the rock formation called the Old Man of the Mountain, a face-like profile in Franconia Notch, until the formation disintegrated in May 2003. The White Mountains range in New Hampshire spans the north-central portion of the state, with Mount Washington the tallest in the northeastern U.S. – site of the second-highest wind speed ever recorded – and other mountains like Mount Madison and Mount Adams surrounding it. With hurricane-force winds every third day on average, over 100 recorded deaths among visitors, and conspicuous krumholtz (dwarf, matted trees much like a carpet of bonsai trees), the climate on the upper reaches of Mount Washington has inspired the weather observatory on the peak to claim that the area has the "Worlds Worst Weather". Major rivers include the 110-mile (177 km) Merrimack River, which bisects the lower half of the state north-south and ends up in Newburyport, Massachusetts. 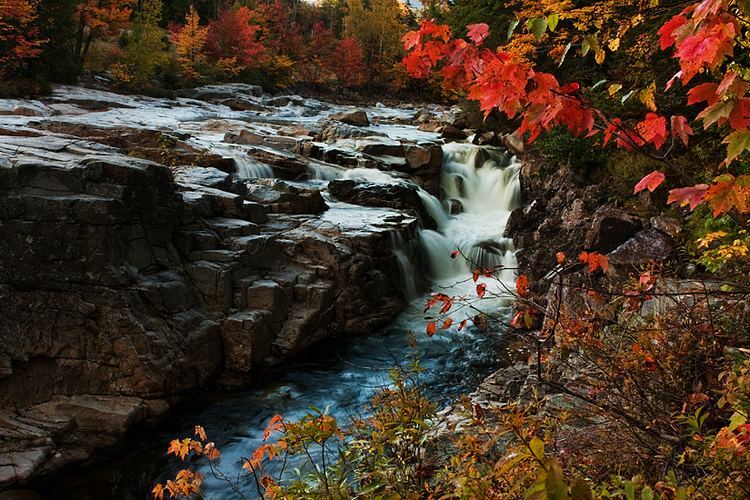 Its tributaries include the Contoocook River, Pemigewasset River, and Winnipesaukee River. The 410-mile (660 km) Connecticut River, which starts at New Hampshires Connecticut Lakes and flows south to Connecticut, defines the western border with Vermont. The state border is not in the center of that river, as usually the case, but at the low-water mark on the Vermont side; meaning that the entire river along the Vermont border (save for areas where the water level has been raised by a dam) lies within New Hampshire. Only one town – Pittsburg – shares a land border with the state of Vermont. The "northwesternmost headwaters" of the Connecticut also define the Canadian border with New Hampshire. The Piscataqua River and its several tributaries form the states only significant ocean port where they flow into the Atlantic at Portsmouth. The Salmon Falls River and the Piscataqua define the southern portion of the border with Maine. The Piscataqua River boundary was the subject of a border dispute between New Hampshire and Maine in 2001, with New Hampshire claiming dominion over several islands (primarily Seaveys Island) that include the Portsmouth Naval Shipyard. The U.S. Supreme Court dismissed the case in 2002, leaving ownership of the island with Maine. The largest of New Hampshires lakes is Lake Winnipesaukee, which covers 71 square miles (184 km2) in the east-central part of New Hampshire. Umbagog Lake along the Maine border, approximately 12.3 square miles (31.9 km2), is a distant second. Squam Lake is the second largest lake entirely in New Hampshire. The northern third of the state is locally referred to as the "north country" or "north of the notches," in reference to White Mountain passes that channel traffic. It contains less than 5% of the states population, suffers relatively high poverty, and is steadily losing population as the logging and paper industries decline. However, the tourist industry, in particular visitors who go to northern New Hampshire to ski, snowboard, hike and mountain bike, has helped offset economic losses from mill closures. Various Algonquian (Abenaki and Pennacook) tribes inhabited the area prior to European settlement. English and French explorers visited New Hampshire in 1600–1605, and English fishermen settled at Odiornes Point in present-day Rye in 1623. The first permanent settlement was at Hiltons Point (present-day Dover). By 1631, the Upper Plantation comprised modern-day Dover, Durham and Stratham; in 1679, it became the "Royal Province". Father Rales War was fought between the colonists and the Wabanaki Confederacy throughout New Hampshire. New Hampshire was one of the thirteen colonies that rebelled against British rule during the American Revolution. By the time of the American Revolution, New Hampshire was a divided province. The economic and social life of the Seacoast region revolved around sawmills, shipyards, merchants warehouses, and established village and town centers. Wealthy merchants built substantial homes, furnished them with the finest luxuries, and invested their capital in trade and land speculation. At the other end of the social scale, there developed a permanent class of day laborers, mariners, indentured servants and even slaves. The only battle fought in New Hampshire was the raid on Fort William and Mary, December 14, 1774, in Portsmouth Harbor, which netted the rebellion sizable quantities of gunpowder, small arms and cannon. (General Sullivan, leader of the raid, described it as, "remainder of the powder, the small arms, bayonets, and cartouche-boxes, together with the cannon and ordnance stores") over the course of two nights. This raid was preceded by a warning to local patriots the previous day, by Paul Revere on December 13, 1774, that the fort was to be reinforced by troops sailing from Boston. 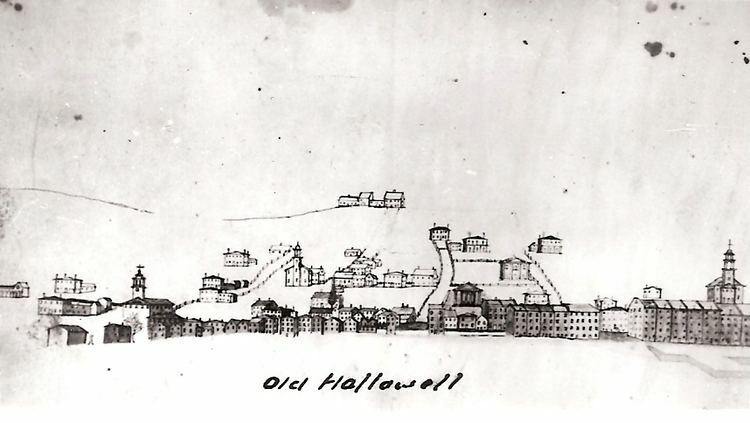 According to unverified accounts, the gunpowder was later used at the Battle of Bunker Hill, transported there by Major Demerit, who was one of several New Hampshire patriots who stored the powder in their homes until it was transported elsewhere for use in revolutionary activities. The Bureau of Economic Analysis estimates that New Hampshires total state product in 2008 was $60 billion, ranking 40th in the United States. Median household income in 2008 was $49,467, the seventh highest in the country. Its agricultural outputs are dairy products, nursery stock, cattle, apples and eggs. Its industrial outputs are machinery, electric equipment, rubber and plastic products and tourism. In the spring, New Hampshires many sap houses hold sugaring-off open houses. In summer and early autumn, New Hampshire is home to many county fairs, the largest being the Hopkinton State Fair, in Contoocook. New Hampshires Lakes Region is home to many summer camps, especially around Lake Winnipesaukee, and is a popular tourist destination. The Peterborough Players have performed every summer in Peterborough, New Hampshire since 1933. The Barnstormers Theatre in Tamworth, New Hampshire, founded in 1931, is one of the longest-running professional summer theaters in the United States. In the fall New Hampshire is host to the New Hampshire Highland Games. New Hampshire has also registered an official tartan with the proper authorities in Scotland, used to make kilts worn by the Lincoln Police Department while its officers serve during the games. The fall foliage peaks in mid-October. In the winter, New Hampshires ski areas and snowmobile trails attract visitors from a wide area. After the lakes freeze over they become dotted with ice fishing ice houses, known locally as bobhouses.